Founded in 1895, the Commercial Law League of America (CLLA) is the oldest association in America dedicated to serving the needs of attorneys and professionals who assist businesses with bankruptcy, collections, commercial, and other legal matters. Its members range from attorneys who are sole practitioners or members of large law firms to judges, law professors and students, accountants, bankruptcy trustees, turnaround management specialists, representatives of the commercial collection industry, publishers of legal directories, bankers, ledgers, and equipment and property lessors. The long history and diverse membership of the CLLA is responsible for its incredible experience and knowledge. Caine & Weiner is a founding member of the fomer Commercial Collection Agency Association (CCAA) an association with around 100 commercial collection agencies that have been CERTIFIED by the Commercial Law League of America. They represent the leaders in the commercial collection or business to business collection industry, handling about sixty-five percent of the commercial accounts placed for collection. The Commercial Law League of America is the nation’s oldest creditors’ rights organization. Members of the former CCAA subscribe to a strict Code of Ethics and undergo an intensive and continuing certification process. ACA International (ACA), the Association of Credit and Collection Professionals, is the comprehensive, knowledge-based resource for success in the credit and collection industry. Founded in 1939, ACA brings together more than 5,500 members worldwide, including third-party collection agencies, asset buyers, attorneys, creditors and vendor affiliates. ACA establishes ethical standards, produces a wide variety of products, services and publications, and articulates the value of the credit and collection industry to businesses, policymakers and consumers. 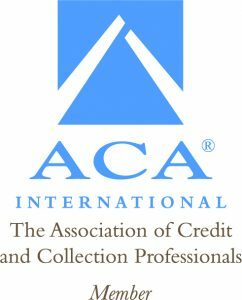 ACA International (ACA), formerly the American Collectors Association, was created in 1939 to bring together third-party collection professionals to advance the credit and collection industry. The International Association of Commercial Collectors, Inc. (IACC) is an international trade association comprised of more than 240 collection specialists and 160 commercial attorneys. With members throughout the U.S. and in 20 countries, IACC is the largest organization of commercial collection specialists in the world. Caine & Weiner is one of just a handful of IACC agencies that has been awarded certification by them. The International Association of Commercia Collectors (IACC) exists to promote the general welfare of the commercial collection profession by providing products, services and growth opportunities to member collection agency companies, attorneys and credit granting professionals. IACC serves members and represents the commercial collection industry by providing high quality industry-related resources and educational programs, promoting professional and ethical industry conduct between members and their clients and creating an environment of trust and integrity. The Equipment Leasing and Finance Association (ELFA) provides its members with direct benefits and comprehensive services, assists in the resolution of industry issues, and promotes high standards of business practices within the industry. The association publishes various books and statistical materials in addition to the magazine “Equipment Leasing Today.” Members may take advantage of many educational programs such as industry seminars, executive roundtables, national conferences, fundamental workshops, and the ELFA’s annual convention. Organized in 1961, the Equipment Leasing and Finance Association (ELFA) is a non-profit association that represents companies involved in the dynamic equipment leasing and finance industry to the business community, government and media. ELFA’s diverse membership consists of independent leasing companies, banks, captives, financial services corporations, broker/packagers and investment banks, as well as service providers like accountants, consultants, equipment managers, executive recruiters, insurance companies, lawyers, publishers, and software providers. ELFA promotes the leasing industry as a major source of funds for capital investment in the U.S and other countries. Headquartered in Arlington, VA, ELFA is a national organization with more than 850 member companies and a staff of 25 professionals. In 2004, equipment leasing was estimated to be a $220 billion industry. Founded in 1919, The Finance, Credit & International Business Association (FCIB) is an international membership group with more than 800 members located in 35 countries around the world. Their members tap into a vast international association of practitioners and experts–export credit and trade finance professionals who’ve tackled the same tough problems. In addition to its US-based world headquarters, FCIB maintains operations in Europe, Mexico, Canada and China. FCIB enjoys an international reputation as a business educator and premier provider of business credit intelligence to exporting companies of every size–from small and midsize manufacturers to Fortune 500 multi-nationals. The networking opportunities available to their members allow them to increase their capacity to troubleshoot export difficulties, improve collections effectiveness, reduce their company’s risk and boost the bottom line.